Weight Capacity 50 lb. per sq. ft.
Carbis Alco-lite painted steel 18 inch modular platform fixed ladder - Model MAFL-18-P. Use in place of an MASU-02 where space may be an issue. 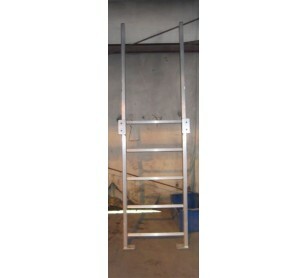 Provides 12 inch platform clearance with a 18 inch platform height/step-off point. 24 inch wide inside with 1-1/4 inch diameter serrated rungs. 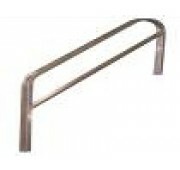 Side rails - 1-1/2 inch x 3 inch tube. 3 foot -6 inch high flared walk-thru top. Support angle mount. Paint Specifications - Surface Preparation - SSPC-SP2, Primer - 2.0 to 2.5 MILS ICI DEVOE DEVGUARD 4160, Top Coat - 1.6 to 2.0 MILS DFT ICI DEVOE SPEED ENAMEL 4318, Specify Color - Industrial Gray, Black or Safety Yellow. Due to different types of atmospheres that this paint system may come in contact with in your facility, it may not meet your facility specification.